The Chicago Blackhawks are one of the original founding members of the National Hockey League (NHL). They have won the Stanley Cup a total of six times (three in the last decade) and are well-known for putting together a competitive side each and every season. The team also has one of the strongest support bases in the league (which is natural for the sports franchises in the Chicago area.) On this page, we have a look at the Chicago Blackhawks odds, standings and upcoming fixtures for this season. The Chicago Blackhawks are consistently considered to be one of the best teams in the NHL. With the side having garnered three Stanley Cup wins in the last decade, it really isn’t that hard not to. 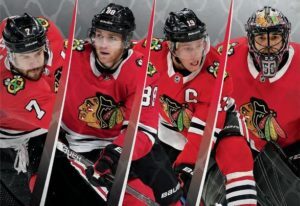 That stated, the team has traded many of the players that were core members of the cup winning squad, including Niklas Hjalmarsson and Marian Hossa. Ove the last two years, the Blackhawks have failed to make the playoffs and it seems that it will be going that way once again. Due to the ongoing poor performance of the team, Joel Quenneville (who has won three Stanley Cups with the Blackhawks) was fired and replaced by youngster Jeremy Colliton. Perhaps, this may spell a new era of victory for Hawks but only time will tell. Overall, we recommend that bettors avoid placing any future bets yet on the Chicago Blackhawks this season. The team does not seem as if it is going to make the playoffs this year in any shape or form. With Colliton being new at the coaching helm, it may be wise to wait a few games to see if the side’s performance begins picking up. However, if you would like to place a bet on the Blackhawks despite all the sides flaws this season, we recommend using one of our recommended sportsbooks up above.